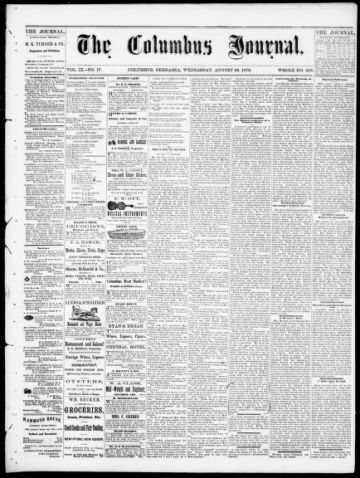 The Columbus Journal, published from 1874 to 1911, was the chief daily newspaper for Platte County and was also distributed in the northeast Nebraska counties of Merrick, Polk, Butler, Dodge, and Colfax. The Columbus Journal succeeded the Platte Journal (1870-74) and in 1911 merged with the Columbus Tribune to form the Columbus Tribune-Journal. In 1913, the title reverted to the Columbus Journal. During its long history, the Journal absorbed a number of newspapers, including the Columbus Times in 1904 and the Platte County Argus in 1906. The Journal featured a broad eight-column format. The paper's founder and chief editor from 1870 until his death in 1902 was Moses Kennedy (M. K.) Turner, a Civil War veteran who had served in Co. K, 170th Ohio. While editing the Columbus Journal, Turner also practiced law and remained active in politics, serving in the state legislature from 1880 to 1881 and running unsuccessfully for the United States Congress in 1884 on a ticket endorsed by the independent Greenback and Anti-Monopoly parties. In the salutatory statements in the first issue of the Journal, Turner wrote: "We have two objects before us as publishers: First to conduct a good, independent local newspaper; second to make money thereby." Although Turner stressed his independence from partisan ties, later contemporary accounts asserted that the Columbus Journal was an influential Republican force in the politics of Nebraska during the Gilded Age. Turner's obituary noted that "There are few lines in professional life that admit of a chance of personal vengeance as does the newspaper, yet he never allowed this to interfere with what he considered his duty." Following Turner's death, his daughter, Martha Margaret Turner—a full-time reporter for the Journal since 1887—served as editor for two years, at which time the paper was sold to a succession of owner/publishers. She later wrote for the important Nebraska State Journal and headed the newspaper department and founded the photography department at the Nebraska State Historical Society.